All of this year’s Talks at the Tower will be about important themes in Hackney’s vibrant history over the last 50 years. 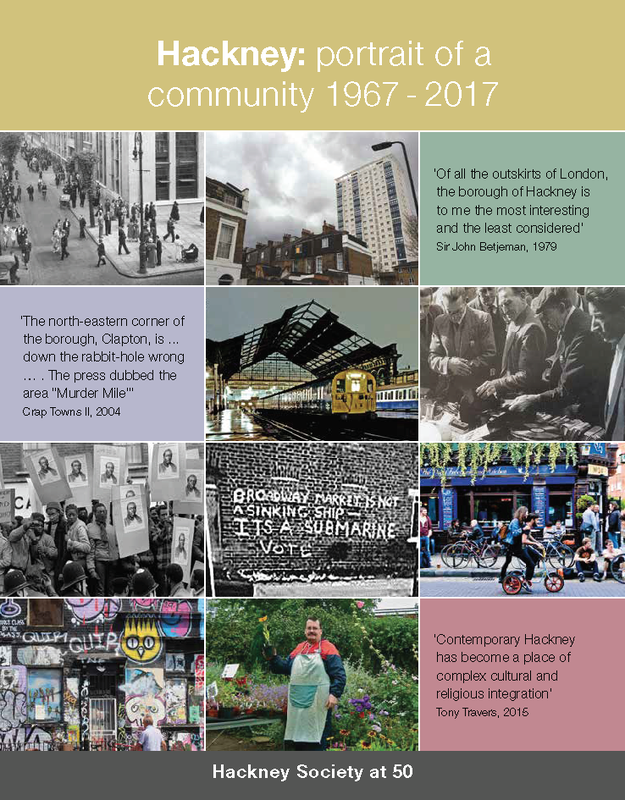 All of the speakers have contributed chapters to Hackney Society’s recent book: Hackney Portrait of a Community 1967-2017. Laurie Elks will take a tour through some of the key events of Hackney in the last 50 years, illustrated by pictures from Hackney Society’s recent book. 1970 was the year that Centerprise was launched in Dalston: bookshop, community centre; and hub of community networking. The following year, SPACE opened their first artists’ studios in Hackney at Martello Street. Ken Worpole and Anna Harding will trace the renewal of Hackney’s cultural life from these early awakenings. In 1983, protests erupted in Stoke Newington following the unexplained death of Colin Roach in Stoke Newington police station. This was one of many protests in the 1980s, a time of great tension between the police and the black community. Duncan Campbell covered these tensions for City Limits and the Guardian and David Hoffman photographed many protests of the time and together they will evoke the very different spirit of those times. Thursday 21st June: Carolyn Clark – Hoxton and Shoreditch: Hip and Hype. At some point in the 1980s, Shoreditch began its transformation from a run down centre of manufacturing to a famed hub of nightlife, hipdom and high tech. Carolyn Clark, co-author of Shoreditch Tales, puts these changes in the context of Hoxton's lively past and describes how they affected the people who lived and worked there. By the 1960s, slum clearance had morphed into “comprehensive redevelopment” as Hackney Council worked to transform Victorian streets into public housing estates. Whilst housing was improved, communities were destroyed. Stuart Weir describes how a community was mobilised to save the streets and buildings of De Beauvoir from the bulldozers, whilst lamenting that the old artisan class community which lived there has been impossible to preserve. All talks will be at St Augustine’s Tower Mare Street E8 1HR. Talks are free but donations are welcomes. Doors open at 7.00 and talks will be at 7.30. To book, go to https://www.eventbrite.co.uk/e/talks-at-the-tower-tickets-44913194574 . This page was added on 10/04/2018.